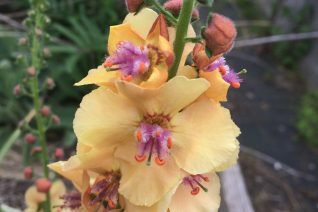 OH MY DARLING, OH MY DARLING, OH MY DARLING Clementine you are lost ….Not lost at all this wonderful Verbascum is delightful and blooms repeatedly from spring to late summer. To 3′ tall or taller in ideal conditions, spires of soft orange to pale yellow depending on the temperature have a central bee of lavender feathers. Adorable and conspicuous as when observed as a cut flower of which this flower is great. The spires of flowers erupt directly from the center of a basal rosette of flat green leaves. Full sun, average to enriched soil that drains with light, consistent summer water. Remove spent blooms and another round will begin. Does not seed around. Mix with other sun-loving perennials with similar cultural requirements. Agastache, Digitalis lanata, Penstemon ‘Enor’ for a LONG LONG flowering spectacle. Winter dormant. Cold hardy and easy to grow. Great flower color for mixing or for tone on tone continuity- for that try it combined with Digitalis x ‘Honey Trumpet’. Big ol magical biennial and we couldn’t imagine a garden without it. 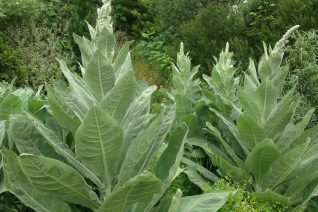 The first year it produces a large (2′ wide) rosette of huge furry white leaves. They lie flush with the ground. The following year total transformation occurs. A spike from the center of the rosette and soars to 6′ or taller. Its lined densely with furry white buds that pop open to reveal electric yellow soft looking flowers. The inflorescence will often wind this way and that. Even after bloom is through this tower remains spreading quantities of seed all over. Germinates best in open disturbed soil and they will germinate. Move them or thin them in spring. Snow white perennial with oodles of architecture. Full sun and rich, well drained soil. It makes due with less than perfect conditions but this way is the most impressive. Loved by pollinators. Light summer water if it looks like it needs it. Established plants get by with no water.